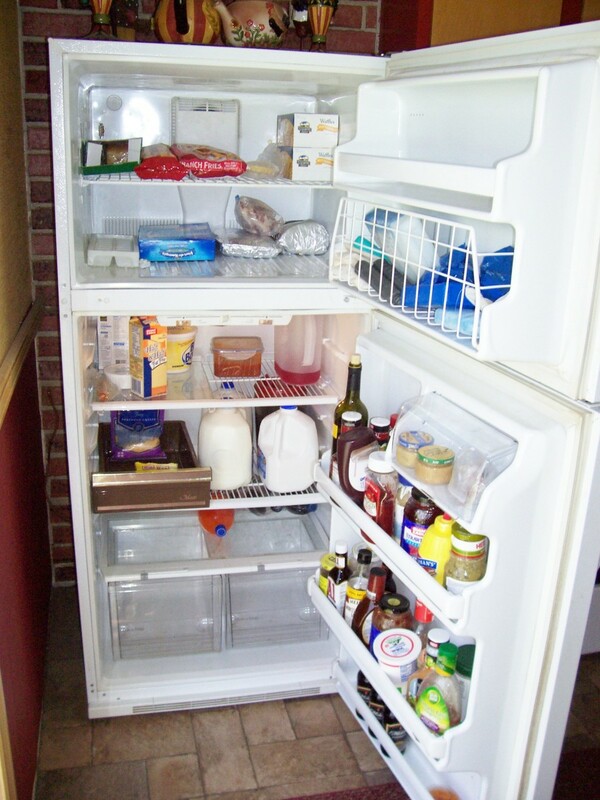 Most of us depend on our refrigerator every day. When it suddenly stops working and it seems unrepairable, we rush to the nearest store to get a replacement as soon as possible. 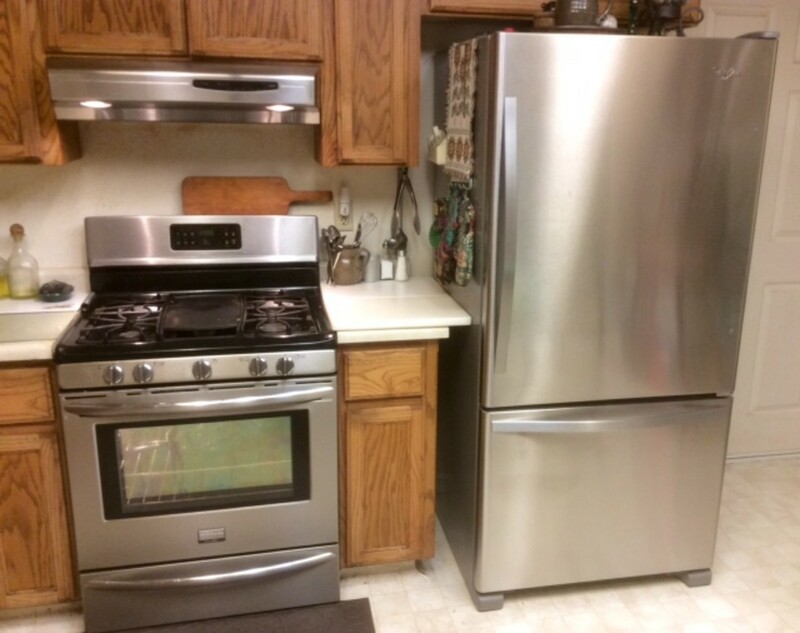 Often, it can be a matter of replacing what you had with something very similar, but you may be more satisfied with your new appliance if you explore all of the available possibilities. When you first notice an interior temperature rise, you need to check your connections and settings. Consult your appliance owner's manual for troubleshooting tips. 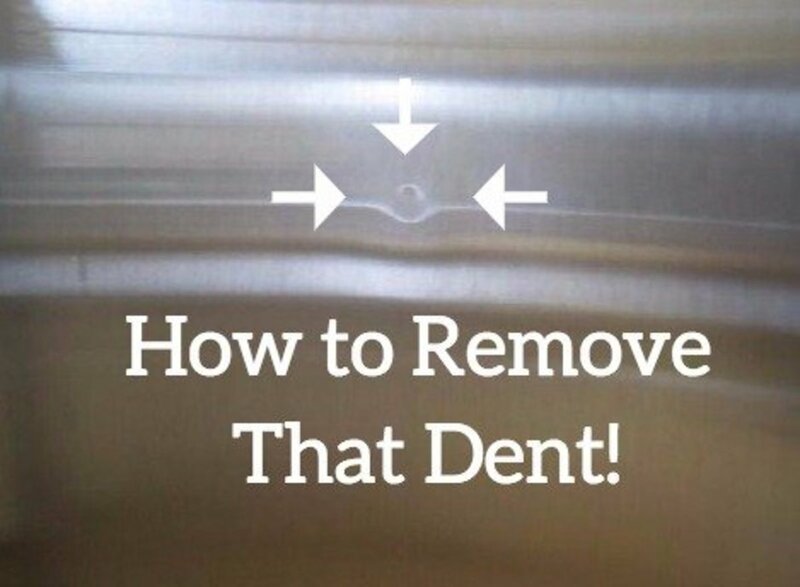 Pull out your fridge from the wall and vacuum the vents and openings. It is possible to have a serious, expensive failure, even if the lights and fan are still working. If you call a major appliance service provider, they will likely charge a fee of nearly $100 just to come and take a look, only to tell you you need a new one. 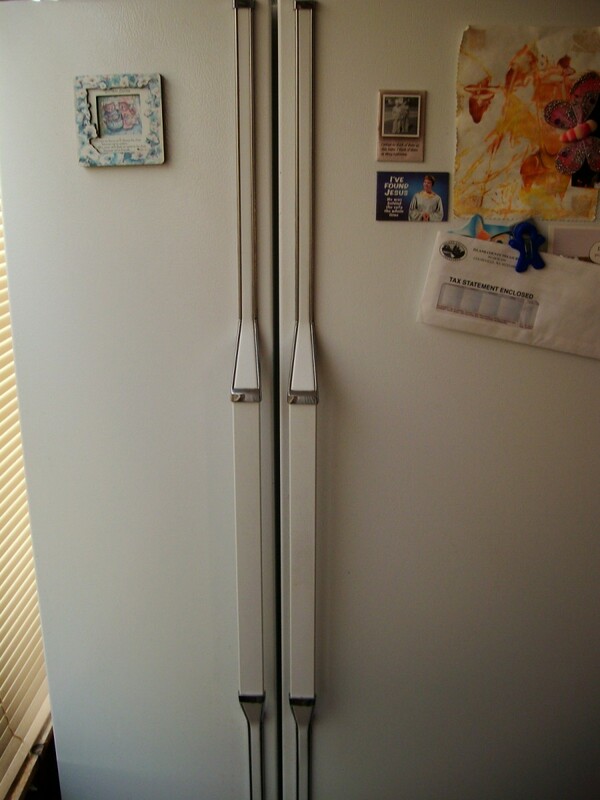 These days, refrigerators only last about 10-12 years if you are lucky. If the compressor goes out repair costs can be more than half of what a new one would cost. If you can find a local repair person, you might get a cheaper service call (or a free look, if they are real nice) along with some advice. Before shopping, you need to consider your likes and dislikes, your needs and your wants, as well as your budget. What type of refrigerator do you prefer? One with ice and water in the door and all the bells and whistles. Just something to keep the butter and beer cold. Size of Inside Space: Know the cubic ft. measurement of your current refrigerator interior. It is usually printed on a label inside or on the back of the fridge. Decide if you could live with a slightly smaller capacity or if you really need more cold storage space. This is very individual depending on family size and how often you shop. Size of Outside Space: Measure the outside dimensions of your old refrigerator and also the dimensions of your refrigerator space. Don't assume they are all standard. My new appliance has a slightly smaller capacity, but it is an inch and a half taller and almost three inches less in width. Function and Convenience: Most new refrigerators have adjustable shelves that can be adapted to your needs. Do you need a door shelf that will hold gallon jugs of milk? Do you want extra large vegetable crispers? 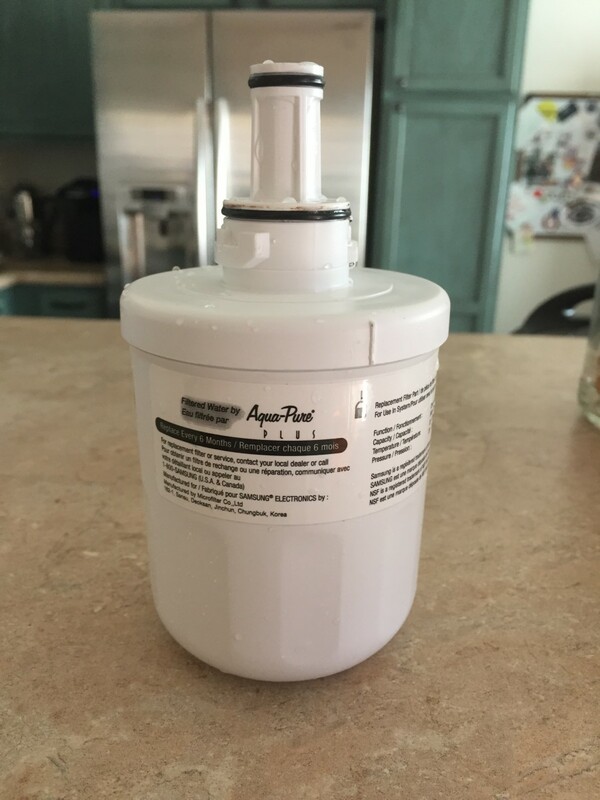 Do you really need a cold water dispenser or an ice maker? Maybe you do. Or maybe you just think it is something extra to clean. Cost: Costs can vary on the very same model and brand depending on the dealer, sales discounts, etc. Also make sure you know if the price includes delivery, installation and take-away of your defunct appliance. These additional charges can add up to $200 or more. Some stores include them in the price. Color: Many refrigerators come in white, black or stainless steel. (Stainless usually costs about $100 more than black or white for the same exact model.) Gone are the days when you could get bisque, and you will probably never see an avocado green or harvest gold finish again. Yes, they used to have those. Looking at internet sites from appliance manufacturers, big box stores and other dealers can give you a fair idea about features and prices. Some of them, such as Lowe's even have interactive sites where you can pick out several models and compare the features of various models. Reading customer reviews may also give you a hint about what problems and advantages particular brands may have. 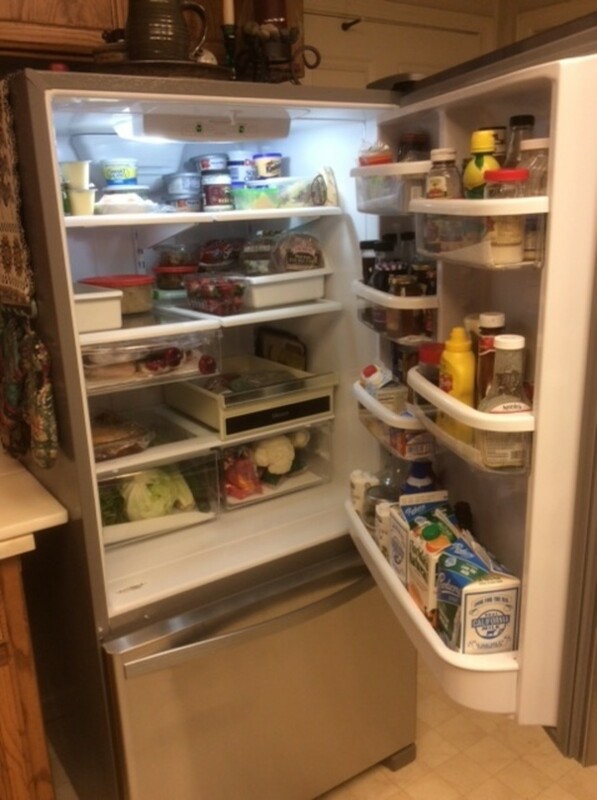 Once you have a general idea about what you want, it is advisable to go see some refrigerators in person so you can actually see and feel how the doors open and close, what the interior lighting is like, and how easy (or difficult) it might be to organize, and access items. If you make a firm decision you may want to order online, or you may feel more comfortable making the deal in person where you can talk to and ask questions of an actual human. 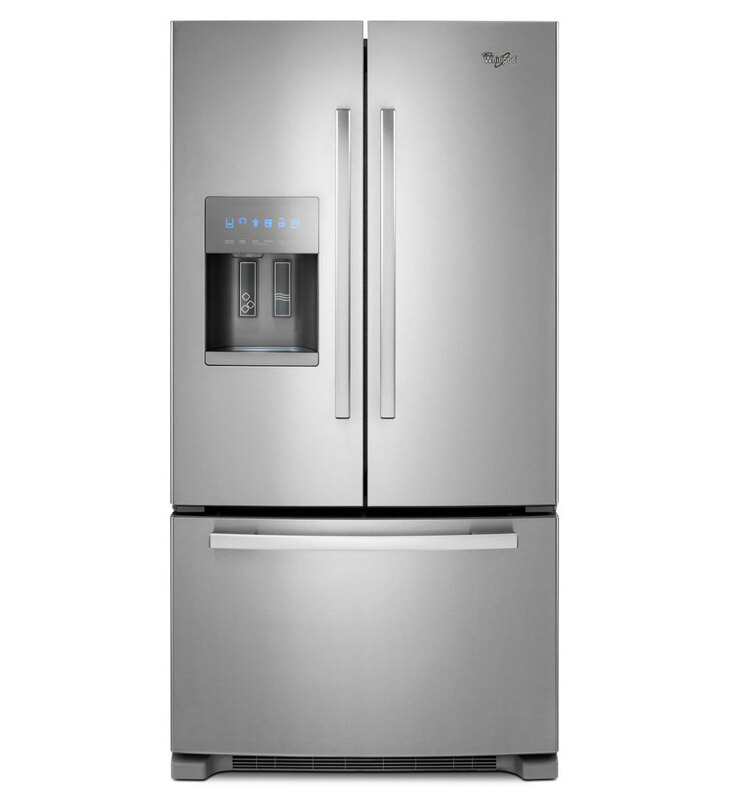 The model shown here is a Whirlpool 22.1 cu ft bottom freezer model. The door provides lots of easily visible storage for small items and the lower shelf is wide enough for gallon jugs of milk or juice. Easily adjustable shelves allows you to make room for tall bottles or short jars. In the main compartment the glass shelves are also adjustable on each side. Lights are placed so contents are easy to find. Crisper drawers were a little bit disappointing. They are one piece of clear plastic and seem less sturdy and somewhat smaller than the ones I was used to. On the other hand, since things are easier to see, and they can't be over-filled, they make it less likely that an old stalk of lettuce might be buried and forgotten. They do seem to slide easily. One of the drawers has a little gadget that is supposed to keep produce fresher. Not sure yet if it is worth losing a little space in the drawer, but it can be removed if necessary. I have had at least four refrigerators with bottom freezers. It makes so much more sense to me to not have to get down to floor level to access fresh vegetables every day. Especially since I open the freezer far less often. 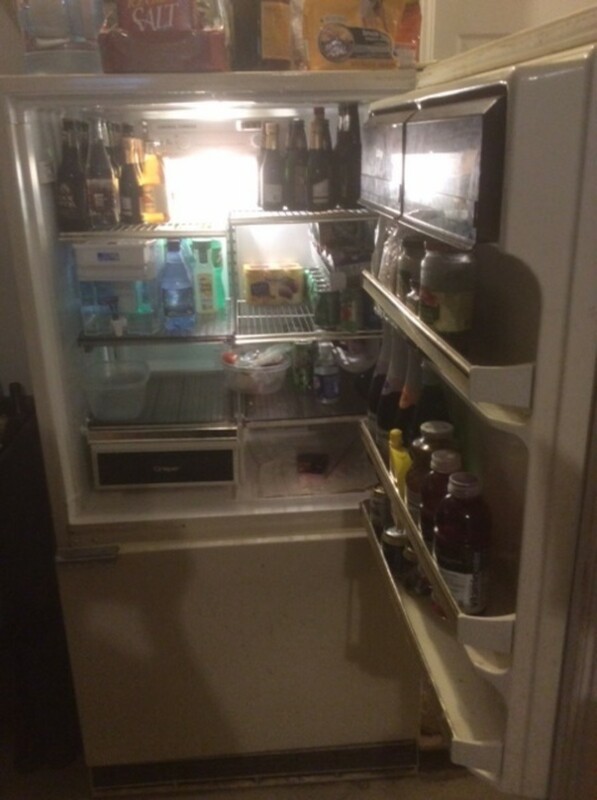 There is a slide out shelf at the top level of the freezer with the ice bin and space for items with easy access. I have always had a swing-open freezer door before, but the roll-out drawer with its deep baskets makes it very easy to actually see what is in your freezer. I have seen other models with a drawer, but they had opaque plastic bins which made it much harder to see what was at the bottom. The freezer bins are what sold me on this particular model. 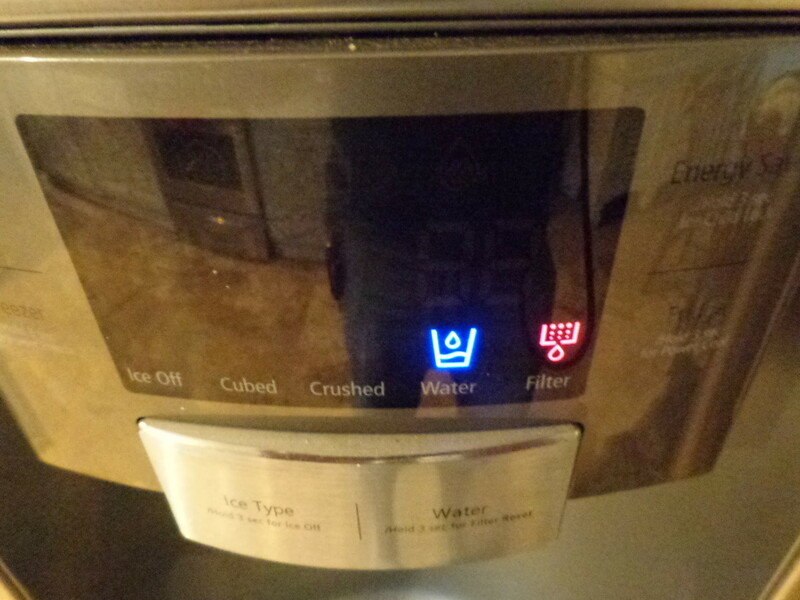 My kitchen refrigerator died on Christmas Day. I had noticed the night before that it seemed a little warmer than usual, but credited the condition to the fact that we had house guests and there had been a lot of opening and closing of the door during the previous day. Luckily, I have another, older refrigerator purchased in 1982, in the garage. I usually use it for extra soda, juices, and overflow storage during holidays or times when I have house guests. Also our garage is right outside the kitchen door, and the weather at that particular time was freezing, so the garage was below 40 degrees F., essentially a walk-in refrigerator. I moved the necessary things from the dying refrigerator out to the garage, and though we did lose a few frozen foods, Most things were OK. 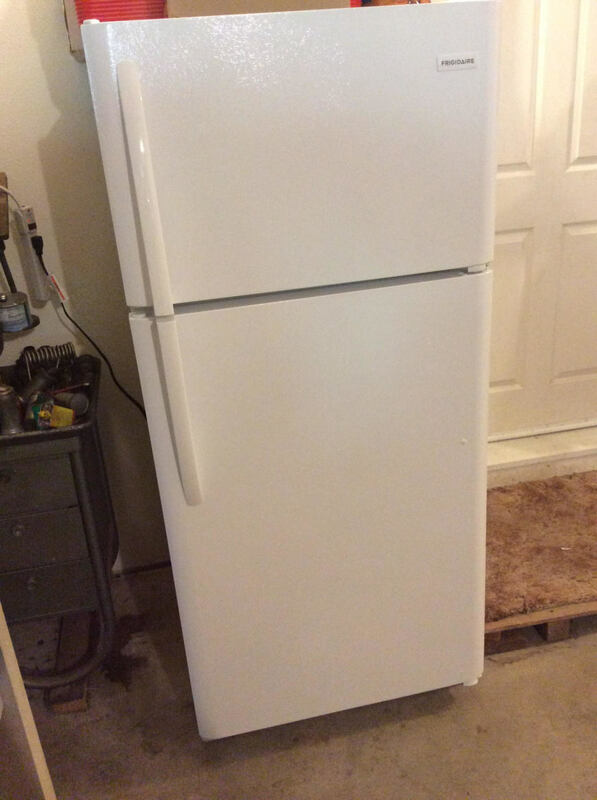 I decided I could live with a little inconvenience while I figured out exactly what I wanted as a refrigerator replacement. Luckily, I was able to take a little time instead of rushing out to buy something that wasn't quite right. After 36 years of faithful service our garage refrigerator has compressed its last gasp of cold air. It owes us nothing, and I am glad for the convenience it gave us. It was so useful that I knew we needed a replacement. We live a long distance from stores and when family or friends come for a few days it is especially appreciated. This time I ordered a "plain Jane" model that happened to have a good discount sale price. It is a little smaller than the old one, but still big enough to store lots of cold beverages including extra milk, juice, cheese and other items that we may need, especially when we have more people to feed. 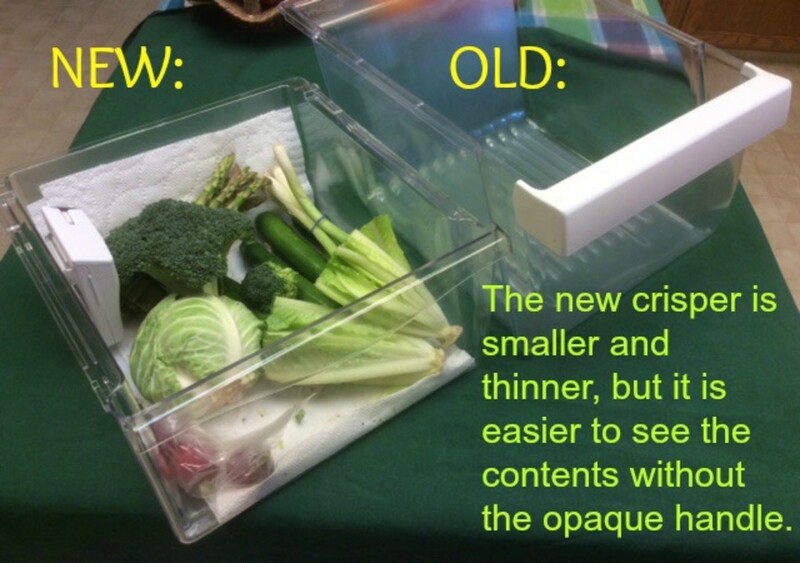 I am less likely to be storing fresh vegetables in this one, so the bottom "crisper" drawers can be used for other stored items. 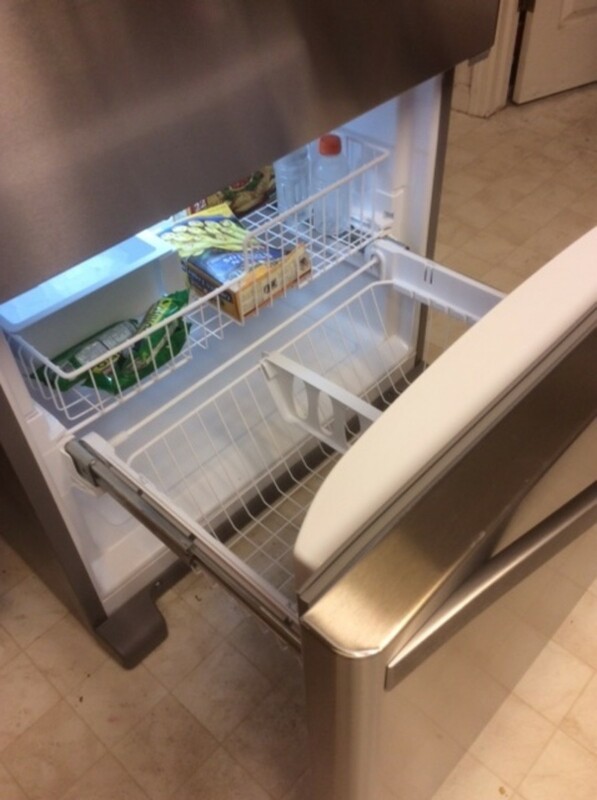 As I said, I usually prefer a bottom freezer but a top freezer model is cheaper, and it is more convenient for retrieving ice cream and other items that might be used after short storage like frozen pizza or burritos. It is more compact, uses less electricity and was less than half the price of my kitchen model. I think it will be very useful. A pyrex glass set of round straight-sided bowls is a great way to keep leftovers (or planned-overs). I keep mine on the eye-level shelf of the refrigerator to make sure I see and use the food, and to prevent the "lost spontaneous developing science experiment" from flourishing in a forgotten corner. When not in use, the heavy glass containers nest, saving cupboard space. In the refrigerator, filled with food, they stack neatly . Pyrex can be reheated in the oven or microwave and is dishwasher safe . . . the perfect refrigerator accessory. Thanks for the comment, rajan jolly, and -- yes -- the plastic bins are not only smaller, they are much thinner than the older ones. I'm thinking they will be cracked before the appliance dies. Other than that, I'm happy with it. We bought a new refrigerator a year back and possibly the biggest as yet. As I can see I followed most of the tips you mention. I'm glad it has lived up to our expectations though these days the quality of the plastic trays and holders is not as sturdy as it used to be once. They are expensive. That is one reason it's important to take all of the factors into consideration. You are right, but don't go to Home Depot for customer service. They will help-- but you have to hunt them down. I like the stainless fridge and stove. Good advice for purchasing appliances. I met someone the other day who said her main complaint was walking into Home Depot and not having the service people even ask if they needed help looking at fridges. Apparently they had been there for a long time at that point. I hope most customers service people would be more helpful than that. Seems like the old ones were made to last. Thanks for commenting. i still have my old fridge, just rusty doors and the whole fridge is functioning well. Anyway, I bought a new fridge, two doors and you know, I didn't use the new fridge until 2 years later after I bought it.!! Don't give up yet. The older ones lasted longer. My 1987 model in the garage still works fine. The ones I bought in '97 and '05 both expired-- got 10 years out of each. I'm hoping for more out of this one, but my hopes are not that high. I'll bet the old one will still be working. Thanks for commenting. Now I'm wondering about my 18 year old water heater, which has already exceeded my expectations. Yes, you bring up a good point. Top freezer models are usually less expensive and are also a little more energy efficient, saving on average about $13 per year in electricity cost. It doesn't seem like there should be so much difference, but it has to do with the location of the compressor. I still like the convenience of the bottom freezer, for me it's a back-saver. Thanks for your comment. Cost is certainly is certainly an important factor to consider. My refrigerator was bought in 1990 so I'm waiting any day for it to fail. Thanks for all the information on refrigerators. Voted up. Christmas Day is the worst time for a refrigerator to fail! We just lost our old fridge. Shopping for a new one, I so wanted a bottom freezer model but we stuck to the old top freezer model. It was so much cheaper! A very good hub about refrigerators!! Like you, we have a secondary refrigerator so could take our time in figuring out what to purchase when our older one eventually dies. The old appliances were made to last! We have an old chest type freezer in the garage that used to belong to my parents. I have no idea just how old it is but it still functions. My dad died in 1985 so it is older than 30 years! 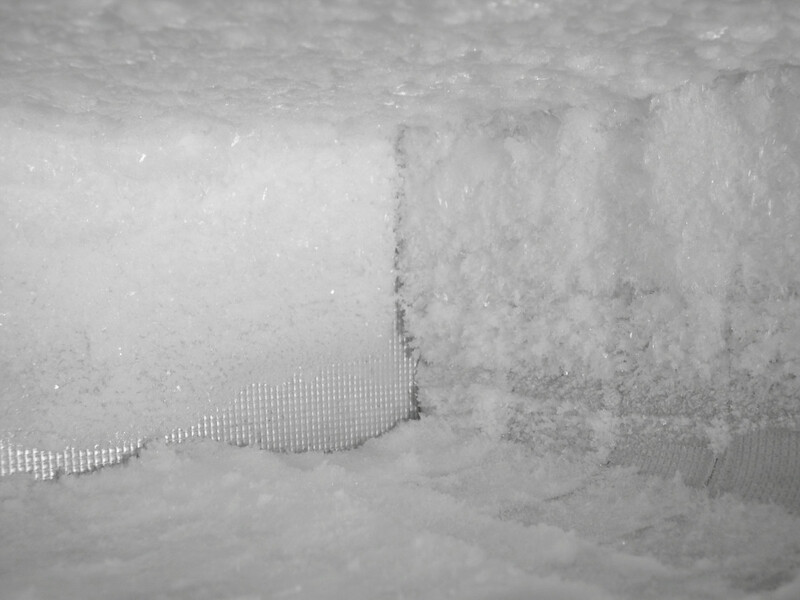 We have to defrost it manually which we need to do again sometime soon. Other than that...it just keeps plugging along! Here in the US, most large refrigerators have crisper drawers. They are covered so they help prevent lettuce and other vegetables from drying out. The drawers themselves are probably not expensive, but a full size refrigerator/freezer is probably the most expensive kitchen appliance for most people. When it stops working, most people are in a hurry to replace it. Taking a little time to consider the options can make a difference in the price . Thanks for commenting, peachpurple. Our fridge doesn't have crisp drawers, is it expensive? I know! The one I got was 'relatively" reasonable, even though they have gone up a lot. To rationalize the cost I have to think, "It should last at least ten years"-- then divide the price by 10 and think if I am willing to spend that much a year to keep my food fresh and convenient without having to shop every other day. I wish they were not so expensive!! It takes a little time to get used to the glass shelves, but really-- after you get used to them-- I think they are easier to clean than the wire ones. If the 'look wet' I suppose they are bright and clean. My new stainless steel refrigerator door, still looks a little odd to me, being used to a neutral bisque exterior. My counter tops and floor are more of a beige/tan color and I previously had appliances to match. When we bought a new range and exhaust hood a year ago, my best choice came in stainless-- so I decided the same finish would go best for the fridge. Fifteen years is a pretty long run, these days. We replaced one a couple of years ago, but it was sort of an inexpensve one. The new one is better in many ways, and i hope it lasts awhile. Yes, good advice, I never liked the crisper drawers in refrigerators, my new one has glass shelves and I dislike them because they always look wet! Good Advice! We are waiting for a new dishwasher. Our old one was 15 years old and we had already had another repair for the same problem.